Sciblogs | Are we getting safe medicines? Are we getting safe medicines? Do you read the small print about side effects? Does your doctor tell you? What are the chances that taking a medicine will kill you or make you ill in an entirely new way? This last question is one reason why trials are run before a medicine is approved for use. However, there is an inherent flaw in the system. No matter how many people are in a trial there is a chance that a side effect will be missed. Consider this: Imagine choosing one school class out of all the classes in the country to check the prevalence of albinism. Given only about 1 in 17,000 people have albinism then you can imagine that it is unlikely that you will find an albino person. However, you may find a red haired child because the prevalence is much higher. If, though, you check a whole school you may still not find albinism. Can you, then, conclude there is none? No, because even if the school has 2000 pupils there is only a small chance of finding the condition. Quite simply, the rarer the condition the more pupils need to be checked. In terms of drugs, the rarer the side effect the more people need testing. In a recent article published in PLOS Medicine (see here) researchers looked at the number of participants in trials of drugs approved by the European Medicines Agency over the last decade. Quite shocking is that for medicines intended for long term use (Chronic diseases) nearly 20% were approved even though they did not meet the Agency’s own criteria for numbers of patients in studies, and these were very very low numbers indeed (300 over 6 months)! 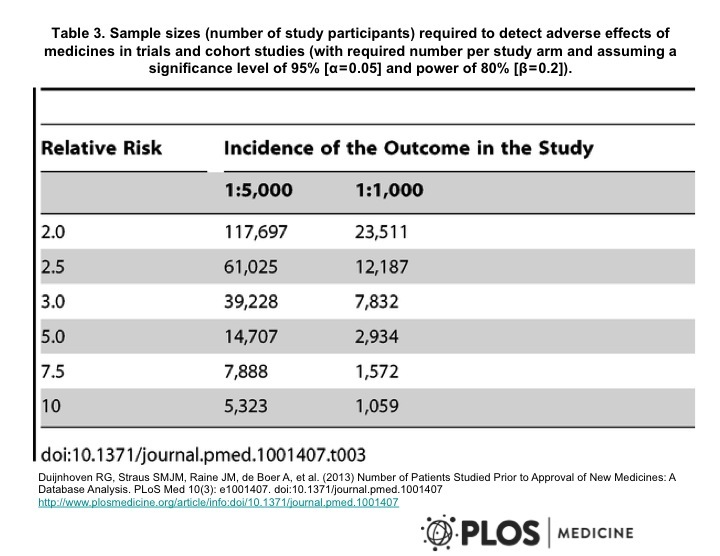 Only about 10% of studies had sufficient participants to pick up on a risk of greater than 5 fold with an incidence of more than 1 in 1000. This highlights why it is absolutely imperative that there are further ongoing studies monitoring side effects of drugs once the drug has been approved. Anyone who has read Ben Goldacre’s book “Bad Pharma” will know such studies are often poorly done if done at all. How do we ensure such studies are done? Do we legislate that drug companies do them (potential bias here), or do we make sure we have a well trained, adequately funded independent group of scientists able to do this? If you think the latter, let your MP know! In the meantime, let the medicated beware. This is why we have critical programmes like The Centre for Adverse Reactions Monitoring (CARM) in Dunedin with its Intensive Medicines Monitoing Programme. The problem is that funding for these organisations is always on the brink, and the ability to undertake event monitoring thus restricted. But it is important to undertake monitoring of drug adverse reactions within our own shores and populations, rather than solely relying on evidence from other countries. The cost/benefit ratio for approval of innovative pharmaceuticals remains high. Even the US FDA has finally realised that, and continues to work on processes to improve that ratio for manufacturers. Late phase ( IIB and III ) clinical trials are the major component of the US $1 billion cost for US FDA approval. The FDA have already introduced the Orphan Drug Act for rare disorders to try and reduce the cost of approval. As the current FDA interest in the incretin pathway drugs for diabetes treatment shows, it does not require expensive phase IV ( post approval and in the marketplace ) studies to identify hazards. The FDA is already showing concerns about the DPP-IV inhibitors ( eg sitagliptin ), and GLP-peptide drugs ( eg Byetta, Victozo ) diabetic drugs – partly based on studies of large health insurance databases, such as the recent JAMA Internal Med paper by Sonal Singh and others that suggested increased risk of hospitalisation for acute pancreatitis. The database contained information on over 1.1 million type 2 diabetics, and obviously isn’t focused research on the hazards of incretin pathway drugs, but the data results give cause for concern, given the potential morbidity of users. That retrospective monitoring of large databases could be an alternative to expensive extensive ongoing clinical trials.